If you're looking for a fun way to get fit and active, rebounder exercises can be a fantastic option. This form of activity has enjoyed a surge in popularity in recent years, and boasts all the benefits of traditional exercise. Also, it is particularly suitable for people with joint conditions as it is low impact and gentle. Many people nowadays opt to purchase their own rebounder for home use, and today we are reviewing the Maximus Pro model. So, read on for out Maximus Pro rebounder review. What makes the Maximus Pro rebounder stand out? How does Maximus Pro compare to other brands? Where do I find the Maximus Pro rebounder for sale? 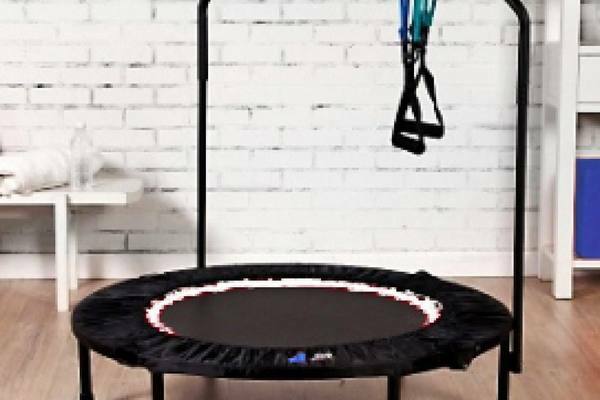 The Maximus Pro Gym rebounder is designed specifically for use in the home. 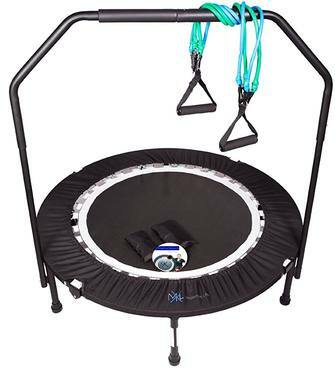 It is similar to mini rebounders found in gyms and specialist classes. Retailing at around $200, it is in the lower-to-mid price range in comparison to other products on the market. Check latest prices here. So, is a Maximus Pro Gym rebounder for you? Here are all the key facts and figures you need to know. Spring-loaded foldable legs: This allows you to collapse the legs of the rebounder. Therefore, you can then store it away in a closet more easily when not in use. Alternatively, this also makes it easier to carry your rebounder around with you. Non-slip mat: As you can imagine, slipping whilst using a rebounder can be dangerous and lead to injuries. The jumping mat on this model has been specially designed to be slip resistant for added safety. Advanced large spring system: Maximus Pro say that their particular spring system reduces impact on joints and ligaments. ​Removable stability bar: It's great that Maximus Pro have included this, as it provides added stability for those who struggle with balancing or people who are new to rebounding and a little nervous. As you grow in stability and confidence, it can be removed. ​Free workout DVD: This includes guided workouts and advice, so you can learn to use your rebounder effectively without visiting a gym or shelling out on a personal trainer. In terms of price and features, the Maximus Pro rebounder is similar to the Leaps and Rebounds rebounder, another popular option. However, the Maximus Pro has the advantage of having a stability bar included, whereas you will need to purchase one for a Leaps and Rebounds product separately. However, the Maximus Pro does not have the safety cover that is a feature of the Leaps and Rebounds rebounder. This is a disadvantage, as the cover prevents your feet from getting caught between the jumping mat and the frame, which can be hazardous. The maximum weight that can be accommodated by the Maximus Pro rebounder is 287 lb. This is quite a high weight limit in comparison to many brands on the market, making it a great choice for plus size users. 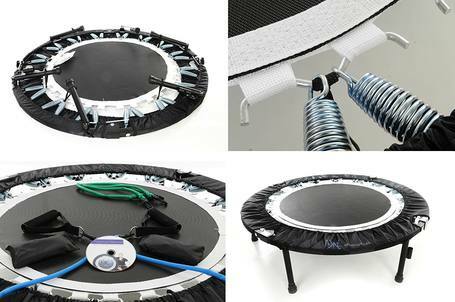 The Maximus Pro rebounder has a 40" diameter, which is the standard size for a fitness mini-trampoline. Also, the product weight is 26.5 lbs. While this may sound like a drawback, the benefit of having a heavier rebounder is that it is sturdier and more stable. We are glad to hear that most customers find the Maximus Pro rebounder easy and quick to assemble as this can often be an issue with rebounders. Also, it's great that Maximus Pro include a stability bar whilst still retailing at an affordable price point. This makes the product budget-friendly whilst still allowing those with balance or stability issues the ability to exercise safely. ​Also, we think that the free exercise DVD is a great perk! This means that you can enjoy expert instruction and a full rebounder workout in your own home whenever you like, without the hefty price tag that comes with gym membership or special prices. The collapsible legs are also a great option. Several reviews say that they are easy to pop up and down, and allow the rebounder to be stored away easily when not in use. We feel that the Maximus Pro rebounder could be improved with a safety pad to cover the springs. If you overbalance, it is possible that your foot could become lodged between the jumping mat and the frame. This may cause you to trip and could lead to injury. However, this risk is reduced if you are an experienced rebounder of if you make use of the stability bar. Unfortunately, a few users have also reported that their rebounder arrived with dents or damage. ​Also, a few were missing important components and found it difficult to track down replacements. A few customers have also said that the springs have broken prematurely. In addition, some rebounders have apparently been shipped without the free DVD, which is one of the key perks of this model. Of course, this is an extremely frustrating experience for these customers. Hopefully, Maximus Pro will seek to address this issue. Overall, we feel that the Maximus Pro is a quality product that provides good value for money. If you're shopping for a rebounder on a budget, then this may be a good rebounder for you. Now you've read our Maximus Pro rebounder review, you have all the information you need to decide if this is the right rebounder for your needs. Happy bouncing!